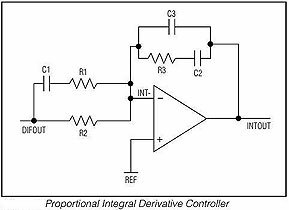 The crucial part of the feedback circuit is a "PID" (proportional integral derivative) controller shown as below. It can be used also as part of your own circuit, eg of a linear regulator, and the same RC values can be used if there is no major other phase shifting element in the signal path. Best is to have a pot for adjusting the overall gain by hand, to find the maximum stable gain by trial and error. In practice there is little hope to obtain the desired long term accuracy of 0.01 degrees or better, together with good control loop behavior (in particular, no oscillation), if the design of the feedback loop is not optimal. Some illuminating literature and practical rules about the design of PID feedback loops can eg. be found from the following notes: MAX1978/79, Analog Devices AN-695 and here. Use high quality (low leakage, unpolarized) film capacitors (eg Wima MKS2), and not tantal or electrolytic caps, for C1, C2 above. Use no ceramic but also a film capacitor for the small cap C3; ceramic caps show a small pieco-electric effect which can affect the stability. Use only low-noise metal film resitors and not carbon resistors. Use low noise and extremely low offset drift operational amplifiers for the feedback loop. With standard op amps like the 741 one cannot hope to obtain any decent stability over temperatur changes. The input and output regions of the feedback circuit should be decoupled (ie, far apart) and very well insulated from each other - recall that we talk here about voltage drifts in the uV range. This also means to avoid IC's with contain both input and output op amps in the same package. Decouple the input/output sections of the PID circuit on the printed circuit board, by having them far apart and/or by having a guard ring connected to ground between them; this reduces leakage (eg due to surface moisture) that would lead to drift. Under these conditions, it would be possible to drive the resonator TEC also with a MAX1968 which can deliver close to 5V; obviously, for the LD this does not work. Note that a with increased heating limit (1A) of the RES TEC, I had repeatedly encountered thermal runaway (heat was so quickly introduced that the circuit didn't catch up with removing it, and the temperature rose to more than 45C before I could shut it down). That's another good reason for a safeguarding shutdown circuit, which is provided by the LTC1923 but not by the MAX1968 circuit. For the KTP and LD TEC controllers, I use the values for the capacitors and resistors more or less as in the MAX1968 data sheet. This works well with short settling times, no serious overshoots and no oscillations. On the other hand, for the resonator TEC there was low-frequency oscillation with period of ca 20s, because apparently the thermal time constants of the resonator assembly differ quite a bit from those of standard LD modules, and so I had to redesign the feedback loop. This is described further below. Some plots showing the loop responses for sudden changes of temperature control voltage are presented in the measurements section. It works very well for the KTP TEC. As said above, the MAX1968 is borderline for using it for the resonator TEC. It is possible to use it if the ambient temperature is moderate; otherwise, the limited output voltage does not allow to get the necessary amps through the two Peltier elements in series. One may try to add a floating constant boost voltage source (of 2-3V, say) in series to the output (of course, one may try this also for the LD TEC). However I didn't do this so I cannot say whether it works satisfyingly. The MAX1968 is tricky to cool; just taken as-is, it can deliver only a few 100mA without overheating (which is enough for the KTP TEC only, for this I have set Imax to 125mA). It has a metal base plate on the bottom, which may be carefully soldered through a hole to the back side of the board. After doing so, the IC's can easily deliver 1.5A and more without getting hot. At any rate, they are easy to ruin, the briefest short of an TEC output to ground or +5V damages the chip instantaneously (while a short between the outputs is curent limited). The schematics is here. It is drawn only for the MAX432x op amps, the alternative circuit for the MAX447x (included on the same board) is the same. The values of the PID controller parts R1-R4 and C1-C3 as shown, are for use as controller for the KTP TEC; for the RES TEC take the values as described below in 4), and R4=10K. For the LD take R4=10K and C2=4.7..10u (as in the data sheet), but as said above, the output voltage is not high enough in order to allow high laser power. The three 100K pots allow to set max TEC voltages and currents, see the table above. The single 100K pot allows to zero the offset between thermistor signal (TH) and adjustment voltage (ADJ); this is not important but makes digital operation easier. The J-2 pinhead can be jumpered for different configurations; 3-4 allows to use a single 5V source, 5-6 can be jumpered for using the internal reference of the MAX1968 (jumpered as shown, it uses the system wide 4096mV reference); 9-10 allows to open the signal path for allowing measurements (Bode plot) and trouble shooting. The number and location of bypass caps between the schematics and the board do not completely match, I used more or less what is shown on the board (not critical). This circuit is more involved than the MAX1968 based one, but is also more powerful -despite being quite small, it can deliver 2.5A up to 20V or more output. It has also some fault detection features. I use it for both the 315M laser diode TEC and the resonator TEC - the values for R1-R3 and C1-C3 of the PID feedback loop are for the RES TEC as described below, while for the LD they are as indicated in the schematics. The schematics follow closely the LTC1923 data sheet, but I have adapted the circuit to the application at hand, and to work together with the other 315M controller components. Besides the LTC1923 PWM regulator, it uses an ultra low-drift instrumentation amp LTC2053, a pair of mosfet drivers LTC1693-1 for level shifting, and a two IRF7343 dual P/N pairs of power mosfets for high voltage switching. The circuit runs smoothly but needs thoughtful adjustment of the pots on the board. P1 is for overall gain and it should be tuned down until stability under all conditions is guaranteed. This is pretty easy for the RES, but for the LD it turned out, initially, that after reaching the max current limit (set by P2, for data see the above table), there was some tendency for sporadic oscillation - this occured ca 1/2h after start, when the heat sink started to warm up and higher cooling power was needed. 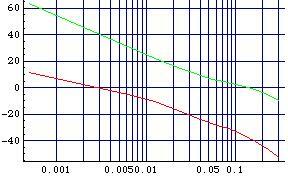 This problem was cured by reducing the gain. P3 can be used to cancel the offset voltage between the "TH" thermistor output voltage and the "ADJ" control voltage - this is handy for the digitial interface, but otherwise not really necessary. P3 and P4 can by used to limit the max TEC voltages - also not too important, they can be left out with the wiper pin grounded. I also included an extra choke in the 12V (really: 10-20V) supply line, otherwise there are considerable switching spikes induced on it. With all the filtering the high frequency switching noise is a few thens of mV on the TEC and supply lines. The connector J-1 links to the data board and is pin compatible with J-1 on the MAX1968 based TEC controller; similar for the output block J-3 (except 12V instaed of 5V is needed). J-2 is for measurements and supervision; FAULT can be connected to a relay (and LED) used to shutdown the whole controller (which is absolutely necessary, otherwise you may grill your diode without noticing until it is too late); H/C can be connected to a LED as well for heating/cooling indication. The computed compensated loop response for these values is shown by the green lines above - there is now a sufficient phase margin, ie the phase stays away from -180 degrees for positive gain, which means that the closed feedback loop should be stable (these computations have been done using the nice Mathematica (demo-)package from Analog Insydes; professionals would probably use PSpice, but I happen to be used to Mathematica). 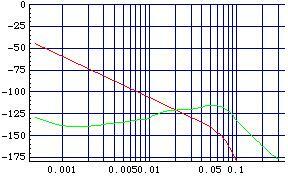 The resonator TEC feedback loop them turned out to be indeed stable (when properly adjusting the overall gain). Note added: I used the same guidelines as described here (mainly based on the rules given in the MAX1978 data sheet) to design PID feedback loops also for various red diode laser modules described in more detail here.